Heartsthone not working now, battlenet://WTCG is changed after last hearthstone patch. Do you know what’s the new shortcut if any? PS: I just downloaded and tested heartstone and the shortcut seems to still function as expected. how does this work? i couldnt understand the source code. The code shouldn’t be hard to follow, almost all the functionality is in Program.cs. Just start in the Main function and follow the code down, if you just read the comments it should give you a general idea. Unless you want to know something more specific. I’ve followed the included instructions, but it fails to launch the requested program. Checking the logs, it doesn’t display an error. Try this, Click Winkey+R to open the run dialogue and then paste battlenet://Pro on it and OK, does it launch Overwatch? If not you may need to reinstall the battle.net client. Alternatively you may try to fix it my using this reg file but reinstalling will likely be there safer route. Is there any way to toggle a region? For example, I want to launch the Overwatch PTR through this, but it keeps defaulting to the Americas region. This is something I would like to make happen but so far been unsuccessful, I even thought I had figured it out recently but it turned out to be a dead end. So for now there’s just no way to do it, sorry. And the problem was…. MSI Afterburner/Rivatuner hooking up on overwatch before steam overlay could. Does the job thanks a lot! Had a problem with it crashing on launch but read the comments and reinstalled battlenet. Thanks! However. I’m very, very interested in getting Uplay stuff to work with the Steam overlay. I’d say Uplay is probably the only place (except Battlenet) where I actually have “real” games I care about, outside of Steam. And with Wildlands, For Honor and a new WD coming up, a polished script solution (or really any solution) would surely be worth its weight in honey! Been using the beta version (v17b2) for a few weeks now, works like a charm for Overwatch and HearthStone! If someone made an app like this (*hint hint*) that worked with Uplay, Origin and GOG Galaxy as well, I’d be happy to pay for it in honey, backrubs, money, beer – or any other currency that the developer might prefer. You’re not the first to ask for Origin and I’ll say it’s very unlikely I’ll ever do anything with it, I don’t own any recent titles on Origin and the ones I do, battlelogium and Origin Requirement Remover already do everything a launcher could do only much better. As for uplay I actually already have a personal solution in the form of a powershell script that use for The division and The Crew, maybe I’ll polish it up for “public consumption”. So as not to be one of those guys that fixes it and abandons it to leave everyone else in suspense, figured I’d post. I fixed it, in a way that strikes me as odd.. perhaps I missed something somewhere. But, I followed your original screenshots for setting it up; Placing the launcher.exe in the Steam directory and letting that be its place. Worked fine for awhile. Just to try to take a stab at this, I moved the launcher.exe to Battle.net’s directory instead and adjusted my shortcuts. Has worked fine since with no issues. There permissions on both directories are identical, so I am at a loss to explain why this is. If changing directories fixed your issue perhaps somehow windows had applied a compatibility layer to it? I reviewed the video a few times, got a overwatch installation on my computer (don’t own it so can only get to the login screen where it asks me if I wan to buy it) and everything seems to be working as it should. bnetlauncher requests battle.net client to start Overwatch, closes it and reopens it under steam to make steam overlay attach to the game, it all ran on my computer the same way it seemed to run on your video being the only difference the start and stop of atbroker.exe (accessibility tools from Microsoft). The only thing that would occur me to try at this point would be to temporarily disable any Anti-Virus or other overlay software to see it has any effect. I’ll also try and run some tests some other machines but that’s about all I can do atm. Daf, I do not. I enabled it just now, the end result was a secondary Battle.net window popped up prompting me for my login information. ?ade do you have “Allow multiple instances of battle.net” enabled on the battle.net client? Daf, I apologize for the delay, don’t have much time to sit down and record these things as of late. But I got the footage for you. https://www.dropbox.com/s/0x0xz61z7z0dj1l/clip0002.avi?dl=0 It’s only of Process explorer itself, and I saw above about disabling browser acceleration but it yielded the same results, so I turned it back on, hence the multiple helper exe’s running. You should throw the sourcecode up on github so you people can report issues and maybe even fix them. If any of you are having the no overlay problem, it may be RivaTuner Statistics Server if you have MSI Afterburner installed. That was my problem. You can disable application detection for Overwatch specifically in the RivaTuner options. Looked at the log and couldn’t find anything that would explain the behavior you described. So I would really appreciate if you could record it with process explorer open with the bnetlauncher processes visible (minimize wininit.exe and chrome.exe process trees) in the hopes of figuring out what’s going wrong. I apologize for the late reply, had some RL issues. As I said, the log never had anything in it, assuming it’s in the actual enablelog.txt file. The only thing that’s possibly worth noting is that when I did look in the folder, a file was in there labeled bnetlauncher_startedclient.lock. I deleted it but it never came back. I’m willing to attempt to record behavior and upload it somehow if that would be an example, but it’s not recording logs as it is. Ah ha! You are correct, I had apparently disabled the hardware acceleration. Thank you for the note about the flaw in my modification. I usually have Battle.net running, so it would have been awhile before I noticed it but it definitely would have left me scratching my head eventually. I have scrapped my modified version and have been using 17b2, your beta version. Functioning smoothly so far, but I will report any issues. Thanks for your swift and thorough responses! I have uploaded a beta version with a new method to detect the battle.net client is running if you could download and test it out I’d appreciate it, so far it seems to be working okay on my computer. I could never figure out why I don’t have two “Battle.net Helper.exe” processes, so I modified your launcher to only check for one. It seems to be working just fine so far, but are there any problems I may run into only checking for one instance of the process? Also, any ideas why I no longer have the second helper process? Your unmodified version worked fine for me a few days ago. To my knowledge there hasn’t been any updates to the Battle.net app and I haven’t made any setting changes. I honestly don’t know, on my own personal computer battle.net client always create the two processes so that’s what i used to make sure the client was fully running. Making bnetlauncher check for a single process breaks launching games without the battle.net client running so i’m trying to better understand what’s going on in the battle.net client. Some theories I had so far where running the client in admin mode (didn’t work), 32bit windows (haven’t been able to test yet) and the launcher not having 3D acceleration on (not sure how to test for that). Once I actually understand what’s going I hope i’ll be able to push something that might work for everyone. It seems in Battle.net Client settings -> general -> advanced settings -> disable browser hardware acceleration will cause only one “Battle.net Helper.exe”, I’m assuming you disabled that setting which caused bnetlauncher to fail, I’ll try and figure out a better way to test if battle.net client is fully open. Those are the three processes I see running. It can’t find my launcher anymore today. Battle net is open and running. [2016-09-26 14:35:56.2755]: battle.net Helpers did not start. It seems bnetlauncher is not finding two processes named “Battle.net Helper.exe” running, could you confirm that they’re indeed running on your system when you open the battle.net client? Works a lot better than /u/malecden’s method, thanks. is that everything in the log? is there any error message displayed? Bnetlauncher stopped functioning for me as of the Battle.net Streaming update. I followed your instructions to enable logging but nothing is in the log itself. If this was already solved I apologize but saw nothing. Blizzard file Switch’s association is present. I too am running Windows 10 Pro x64 Build 1511. The behavior is as follows; The launcher WILL actually make the game of choice launch, but the process itself terminates and I get no overlay. In Overwatch’s case in particular, it will launch, try to connect and have an overlay, then closes, then re-launches and prompts me for my Battle.net login. Any help would be appreciated, hate not having my overlay. Do you have blizzard streaming enabled? Could you also still post the log (or email it to me if you prefer)? I just tried and Windows doesn’t recognize the command, it asks me to search an application on the Windows Store. It could be the problem, I don’t know if it’s specific to me or if Blizzard changed something but it doesn’t work on my friend’s computer too. There’s a few things you can try, you can go to “Control Panel\Programs\Default Programs\Set Associations” and check if BATTLENET entry is associated to “Blizzard File Switcher” (it’s actually just the battle.net.exe in program files), you can try reinstalling the battle.net client to see if it restores the association or you can try importing this regfile of the file association i took of my computer (Windows 10 Pro 64bit), only do the registry import as a last resort though. [2016-09-07 13:28:55.4422]: Failed to start battle.net client. With the battle.net client closed, could you try pressing Winkey+R to open the run menu and typing battlenet:// and seeing if the battle.net client actually starts? Do you plan to add support to Overwatch Test and add an option to toggle if battle.net should close or not after the game launches? Sorry for the late reply (notification on new comments borke down). 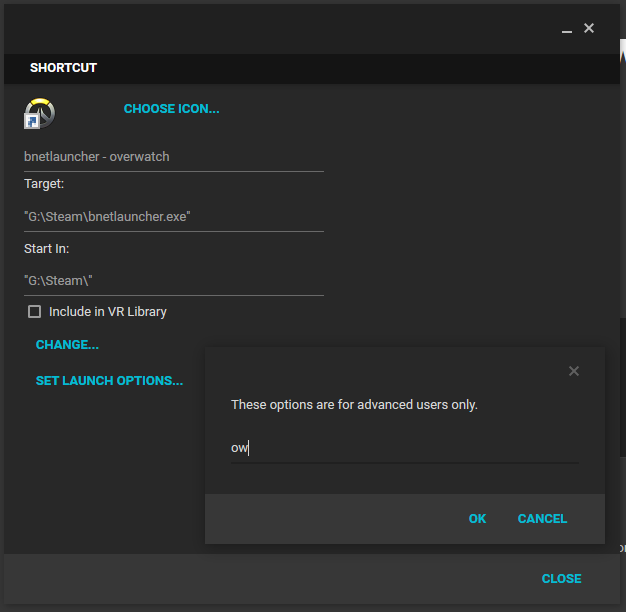 Supporting the launch of PTR version is not supported trough the current method used by bnetlauncher, I might look into it but atm there’s no immediate plans to add it. As for leaving battle.net client open it’s not a good idea as it would make steam think you never closed the game until you closed the client. I already spent a few hours trying to work around that without much success. Tried using this today on Windows 10 Pro, but nothing happens. Tried with the battle.net client running and closed. [2016-08-25 15:56:01.2405]: battle.net Helpers did not start. [2016-08-22 15:49:34.3485]: No child process found. [2016-08-22 15:49:45.2656]: No child process found. [2016-08-22 15:49:45.9070]: No child process found. [2016-08-22 15:49:46.5643]: No child process found. [2016-08-22 15:49:47.2169]: No child process found. [2016-08-22 15:49:47.8617]: No child process found. [2016-08-22 15:49:48.5076]: No child process found. [2016-08-22 15:49:49.1505]: No child process found. But if I run the game before bnetlauncher crashes, it works, but doesn’t stick. Upon the next launch, it does the same thing. How can I solve this problem? Actually scratch that.. I found the issue. It apparently doesn’t like if I run it without Battle.net being open first. With the older 1.3 I could use this and it would just start it, then launch. But this one seems to be different. Should I just keep the launcher open all the time? The latest version should work in the same way, are you still having issues? If so could you provide a log? Sadly this doesn’t work for me anymore. 1.3 recently stopped working, so I updated to 1.6 and it launches the Battle.net launcher with Overwatch selected, but it won’t automatically start the game. The overlay doesn’t work either, on the launcher nor the game. I’m running into an unfortunate issue where this program, or, I suppose you can say the Steam overlay, conflicts with TSNotifer (a TS3 overlay http://tsnotifier.cfxxl.de/). If TSNotifier is already running, the game will not allow the Steam overlay to inject, essentially preventing it from being usable even though the game is being launched through Steam. Launching TSNotifier only after the game has started through Steam has the opposite effect; the overlay never appears, but the Steam overlay continues to work. I doubt this is an issue you can solve with this utility, but I thought it’d be good to bring it to your attention, just in case. You are correct, the only ones that can really fix that are the devs of tsnotifier and/or steam. Could you provide a log file? The instructions.txt has steps to enable it. Hi hedi, sorry for the late reply. Could you see if the “Windows Management Instrumentation” service is enabled and running on your system? I just tested the new version and everything is working fine for me. I only have Overwatch though, so I can’t really say anything regarding other games. I’ll download HOTS and HS later. From the log everything seems to be working as intended so the overlay should be showing normally. Do other battle.net games show the overlay? If it’s just Overwatch then I’ll try running some tests on a friends machine (don’t own it and there’s not starter edition) . The log only works if you create a enablelog.txt in %localappdata%\madalien.com\bnetlauncher\ (you can copy the address into explorer to open it. Could you do that and send me the content of the log so I can try and see what’s going on?